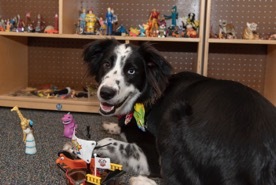 If you’ve stopped by Austin Family Counseling lately, you may have noticed a new four-legged friend walking around the office with one of our therapists. This sweet pup is named Rio, and he is a therapy dog at AFC. 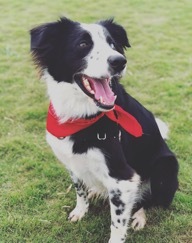 Rio is a 2-year-old border collie with one blue eye and one brown eye (a condition called heterochromia). 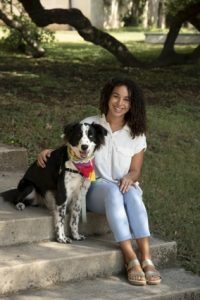 He is a Canine Good Citizen certified through the American Kennel Club and is a graduate of the Animal-Assisted Counseling Academy at Texas State University. Rio has completed extensive training to work with clients and is always excited to meet new people. 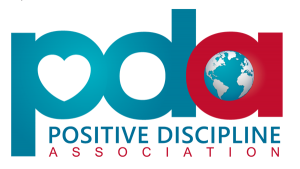 You can learn more about our certification here. Rio and I work as a “canine counseling team” to help clients grow, learn, and achieve their goals. We are certified in a therapy technique referred to as animal-assisted counseling. Animal-assisted counseling (AAC) is a goal-directed process in which a trained therapy animal works in partnership with a therapist to help clients resolve psychosocial challenges and achieve growth. AAC often involves using experiential and expressive interventions that include the therapy animal. Increase in client motivation to participate in counseling and a sense of safety (Lange, Cox, Bernert, & Jenkins, 2006/2007). The process of touching an animal partner can help clients regulate their body and their emotions. Clients may also develop better social and communication skills through the process of AAC. Rio offers many examples of self-regulation, communication, and emotion expression in a session that can help clients learn more about their own ways of expressing. You can learn more about AAC by visiting our FAQ. I see my clients light up when Rio comes out to greet them in the lobby. Clients are able to form a valuable connection with another creature as they process and overcome life’s challenges. Sometimes that bond builds a little quicker when it is with a therapy dog like Rio 🙂 You can stay up to date with all of Rio’s adventures in counseling by following him on Instagram. In future blog posts, I’ll share examples of interventions Rio, and I use with clients. Although most of my clients are children or teens, the interventions can be adapted to work with adults as well.